As part of the Global Urban Humanities Initiative Colloquium called Reading Cities, Sensing Cities, we have asked students and visitors to write responses to each of the weekly guest lectures. 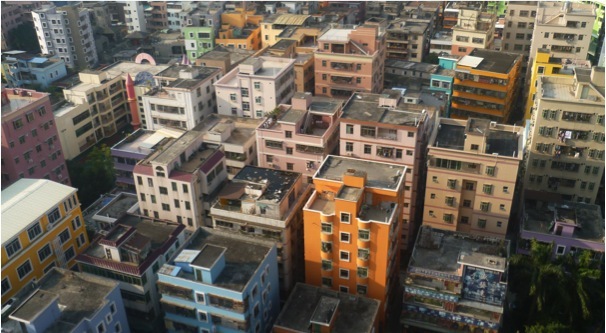 On August 28, 2014, Prof. Margaret Crawford (Architecture) gave a presentation on her continuing research on urban villages in the Pearl River Delta—independent jurisdictions that are being swallowed up physically and administratively by large cities. Along with Asst. Prof. Winnie Wong (Rhetoric), she will be teaching a studio course on the Pearl River Delta in Spring 2015. Video of the first portion of her presentation is available here. As an exchange student from Chinese majoring in urban planning, I was attracted by Margaret Crawford’s presentation at the first sight of the poster announcing the lecture. It was especially interesting to me when Margaret talked about the urban villages in Guangzhou, my hometown. Here, I would like to share some thoughts with you from my point of view as a Cantonese person. Urban villages occur in almost every fast-developing city in China. “Village” has a particular meaning compared to the term in other countries due to some unique principles and regulations that apply only to places designated as “villages” in China. In my eyes, urban villages have a poor and backward image. I had never associated urban villages with art. As Margaret showed us in her slides, urban villages are full of ‘shaking-hands buildings’ (built so close together that people on the upper stories can shake hands with each other out of their windows) and ‘under-construction areas.' In recent years, people in Guangzhou, including me, avoided getting too close to urban villages. Buildings there were dangerous and seemed quite ready to collapse. Most inhabitants were either farmers or the poor. I wondered, “How could urban villages do anything with the arts? In what way can they be able to connect with and influence each other?” I now think the old and out-of-date opinion towards urban villages should be rethought, considering the developments that have happened in the recent years. Take Zhujiang New Town, for example, which is also an urban village in Guangzhou. It has now developed as the new central business district of Guangzhou: the old images are now replaced by skyscrapers and modern facilities. This progress is enhanced by the force of cooperation between government and villages’ residents and, of course, even the whole society. Art exists in many ways and forms during the development of urban villages. Arts in Zhujiang New Town are developing in the normal way: old buildings were replaced by new ones directly. Brand new green projects cover the formerly desolate area. Arts in Xiaozhou Village develop in another way: many old buildings remain as art galleries or other aesthetically creative spaces for artists. ‘Shaking-hands buildings’ might represent the typical image of most urban villages in Guangdong. However we should look at the bigger picture of this developing topic, by knowing that arts exist in both the modern way and traditional way in urban villages. Siying Wang is a visiting student at UC Berkeley.